Bomani Jones is the epitome of unapologetic wokeness. And his guest appearance on ESPN's Mike & Mike on Thursday morning has set Twitter on fire with his choice of clothing, that was nothing less than genius. Bomani's ability to produce White tears without consequence is really the stuff dreams are made of. Jones decided to make some sartorial satire when he wore a shirt that said "Caucasian" across the front, with the face of a caucasian as the mascot. 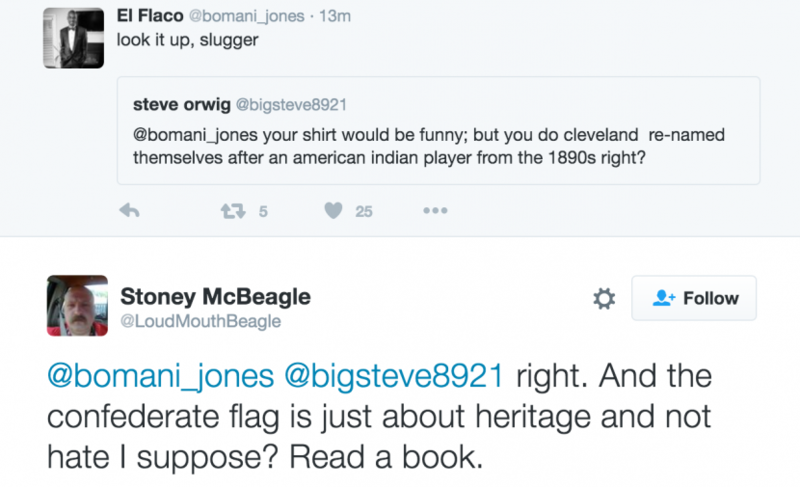 Wearing the shirt that mocks sports' jersey caricatures of North American Indians, notably the Cleveland Indians (but we're looking at you too Washington), this, no doubt, set off a lot of accidental (and on purpose) racists in the Twittersphere. Would you rock this shirt? Which is for sale at Shelf Life Clothing for just $30... and the priceless acquisition of white tears!